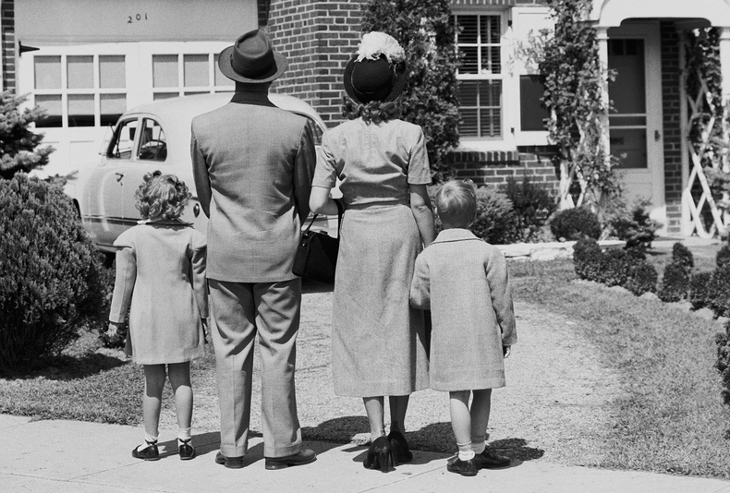 The Baby Boomers and their parents made home ownership a central component of the American Dream. Millennials are changing this. During the 2014 Gensler Design Forum held in San Francisco, John Rahaim, Planning Director City of San Francisco, and I presented ideas about how cities must evolve in order to create sustainable, prosperous futures. As part of our repartee, I represented “the who” as in, “who are the designers and planners making great cities for now and in the future?” We sought to identify issues that need to be reframed and questions that need answering as cities grow and evolve to meet changing demographics and increasing density. I thought this exploration would set the table for a discussion of urban design, resiliency, and infrastructure. However, my query took us to a much broader conversation: Why are American cities lagging behind their foreign counterparts in providing appealing work and lifestyle options, and will this trend jeopardize the future of the American Dream? First some context. It’s well documented that Americans are migrating to cities in large numbers. The two groups primarily responsible for this pattern are the Baby Boomers and the Millennials, generations similar in size but very different in outlook. While these generations have radically different contexts for urban life, and thus face different challenges when it comes to urbanization, they both see a future in cities and their concerns occupy the same space as the larger issues confronting cities. Simply put, there are financial, infrastructure, and political challenges that need to be resolved for cities to sustain increased density, economic prosperity, and quality of life for both groups (and for the rest of us I might add). As the next generation pursues prosperity and its unique version of the American Dream, it will do so within urban areas. Like the suburbs of the 1950s and 60s, cities are the landscapes at the vanguard of American life. Unfortunately optimism about our urban-centric future is hard to find. 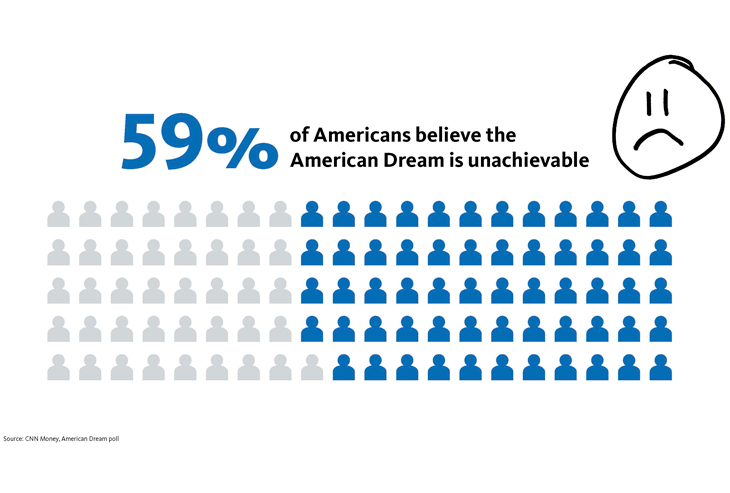 A recent CNN Money Poll showed that 59% of Americans believe the American Dream—the idea that regardless of background, every American has the opportunity to blaze a unique path and achieve his or her dreams—is no longer attainable. One plausible explanation for such pessimism: the poll’s core measurement of success involved economic prosperity, of which land ownership – a homestead for every American – was a key benchmark. Property ownership has become an increasingly untenable proposition for young Americans, many of whom are opting for short-term renting options as opposed to long-term ownership. Land ownership became a central tenet of economic prosperity in post-World War II America. Baby Boomers, who flirted with communal living arrangements in the 60s, eventually embraced home ownership and built upon the ownership economy their parents had established. Boomers came to value status symbols like homes and cars. This stemmed from the notion that it was important to own and control the spaces you inhabited on a daily basis. Today, Boomers continue to value ownership; they want to own the urban condos and row houses in which they plan to retire (though many have surrendered their cars for public transit options). Millennials, on the other hand, cherish experience over ownership. These digital natives see everything as software that can be shared, customized, refreshed, and improved. Millennials also eschew ownership out of economic necessity. Burdened with student loans and entering a workforce in which wage growth remains stagnant, Millennials tend to seek out cost effective alternatives. For this generation, it’s not the domain you own, it’s the life you experience. And their preference for renting explains the proliferation of companies which provide service and experience without the need for ownership: Uber, ZipCar, and AirBnB. These companies provided access to experiences without the upfront investment, and with apps it all happens on demand, on the user’s terms. For a generation of digital natives, one that embraces social networking and crowdsourcing, this is an empowering moment focused on creating a new definition of status. While the debate between ownership and renting illustrates the different value systems of Baby Boomers and Millennials, it only partly explains the shared pessimism over America’s future. Gloomy economic data also factors into the equation. A recent Pew study on income mobility shows that Americans are less likely than citizens of other countries to migrate from one income bracket to another. (Some countries in Scandinavia are out pacing the U.S. by as much as three to one in this area.) Furthermore, Millennials have just endured the Great Recession and have the lowest employment rate and lowest rate compensation compared to the rest of the generations that make up the workforce. At the same time, pension payouts have increased dramatically creating a debt burden on this generation with far reaching impacts on government’s ability to make the necessary investments in critical infrastructure without raising taxes. After-tax income growth is the lowest among the bottom 20% of earners while the cost of quality of life necessities have gone up. In addition to rising healthcare costs, Millennials have more college debt than any other generation as costs of education at all levels have increased. This adds up to a cost for city living that teeters near a point that many Millennials can not afford. Two thirds of this generation are flocking to cities even though doing so puts them at risk of going broke. In the past, we have relied on technological innovations to overcome economic hurdles, and we have invested heavily in domestic infrastructure to ensure that future generations could experience a better quality of life. But this two-pronged approach may be in jeopardy. In terms of innovation, the United States sits in an enviable position: We continue to produce game-changing innovations at a substantial volume. However, we have fallen woefully behind in offering suitable quality of life. A recent Monocle magazine survey of the cities with the best quality of life lists only one U.S. city in the top 25: Portland, Ore., at 23 is our lone representative. Three of the top five are in Scandinavia. What the Monocle’s top 25 cities share is an aligned socio-political agenda geared towards investing in core urban infrastructure and creating “entitlements” for their people. These cities are willing to spend the money with an eye towards the future. The Monocle survey highlights the toll inflicted by our divisive political environment. Because we lack socio-political alignment, we are not making investments in critical quality of life infrastructure. The once greatest democracy in the world is now the 17th ranked democracy according to the EIU Democracy Index, and U.S citizens are not happy about their situation. According to some surveys on “happiness” the United States is barely in the top 20. These surveys look at healthy life expectancy, perceptions of corruption, GDP per capita, freedom to make life choices, social support, and generosity among other quality of life statics. Current technology allows for increased mobility and connectivity around the globe. Work can happen anywhere at any time. The war for that talent is global. Cities abroad are actively seeking to lure talented people and revenue. In this flat world, living and working can happen where the quality of life is best, and the access to great talent is highest. Will future generations of Americans always choose to stay close to home, or will they migrate abroad to cities that offer better quality of life than what’s found in American cities? So as our cities grow and their ability to make necessary improvements falters, we find ourselves at a crossroads. If we want to reinvent the American Dream for the 21st century and maintain prosperity in the broadest sense, we need to consider what smart investments are necessary. Will we continue to place our faith in corporations, or will we ensure cities, the places where Americans want to live, work, and play can provide citizens with necessary amenities? Consider that the average lifespan of S&P 500 companies has declined to 15 years. It is believed that technology and innovations in healthcare will continue to extend life expectancy and that there may be a person alive today that could live to be 150 years old. Just think about the burden on our overstressed infrastructure and cities with that kind of population jolt. There must be alignment of innovation and quality of life to stay competitive in the global economy and attain a sustainable future. We find ourselves at a crossroads, so to speak. Cities will need to respond if they want to continue to function. As part of that response, communities should consider how best to balance investing in our populations versus investing in our corporations. Those corporations are giving the innovation metrics a boost for now, but where is that ROI going and how long will it last? With increased mobility will we be able to sustain our talent needs, or will we see our best and brightest decamp abroad? Quality of everyday life, in addition to sustained innovation, is needed to preserve the American Dream in an increasingly urban America. Peter Weingarten is passionate about making great places for people. A native New Yorker living in San Francisco, Peter thrives on dialogue and through his extroverted personality is constantly studying the human condition and how society ticks. His practice as a leader in the development of cities and their architecture allows him to passionately pursue sustainability, urbanity, and the evolution of how people live, work, and play. Contact him at peter_weingarten@gensler.com.